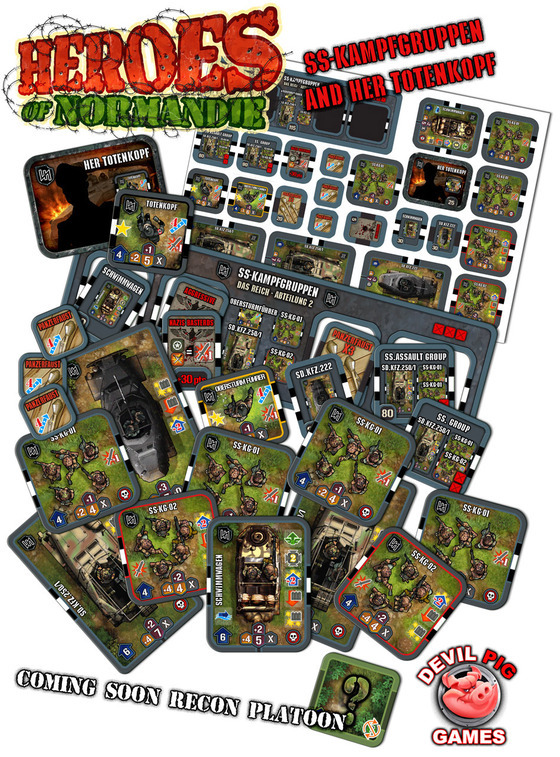 I have just published episode 107 of the Meeples & Miniatures podcast in which I talk with Clement Seurat of Devil Pig Games about their Heroes of Normandie Kickstarter project. I thought I’d give you a glimpse of what the sort of artwork that is promised in the final game. It’s going to be printed in full colour on 2mm – 3mm thick cardstock. There is a print n play demo on their website. It’s a decent system but too light on the combat mechanics for my tastes. However I can’t get past their model of a minimum pledge of $135 to get the stretch goals! When you say “too light on the combat mechanics” what do you mean? The combat mechanics have are an intergrated die roll which incorporate weapon and cover modifiers. Seems perfectly reasonable to me – especially as they have stated that these rules are for demo purposes and will be more fully expanded in the final version. Obviously, the immediate thing that is missing is any Morale factors – I’m waiting to see the full PDF rules published in English before I judge any further. On the stretch goal front, as I understand it, they have 2 levels of stretch goals – the first level is at £45 (i.e. 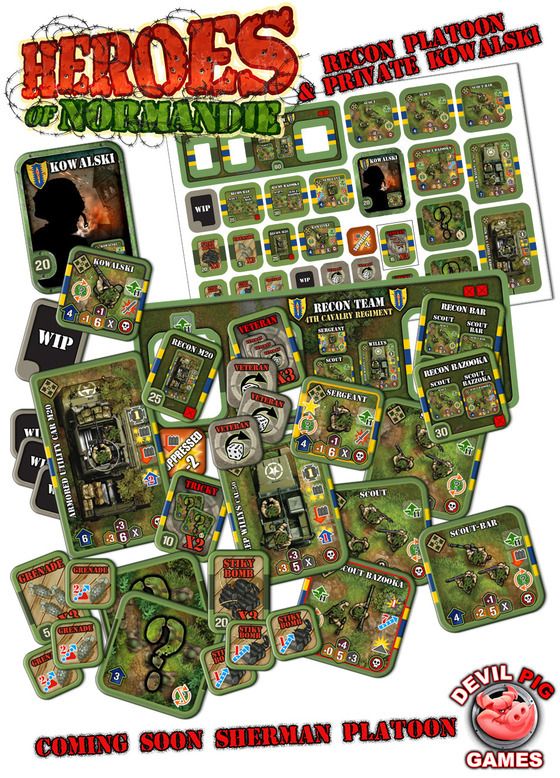 buying the base game) and the second level is at £90 (Overlord) – Yes, only Overlord backers get all the stretch goals, There are 7 stretch goals currently unlocked which are available to everyone who has pledged £45 and over. Unless my maths is off, £45 (or £60 with shipping) is still a lot less that $135. But yes, if you want to have access to every stretch goal, you have to pledge £90. The rules are a demo version but there isn’t any more “weight” to them in the full version, just different abilities and units. This has been discussed on the BGG forums. I’ve played Frontiers, the game this is based on, which is nearly the same except this uses squares instead of open movement, and of course the period covered. Frontiers is a decent game, but it’s definitely a watered down version of a miniatures game as compared to nearly all other systems out there. The rules is a major issue; on BGG they have promised to have an English translated version of the full rules available this week, I will be interested in seeing that to decide further. The price really is the killing point for me. Obviously that’s a personal judgement but in my opinion there isn’t much game here for the premium price – and I figure into this the fact that this a pledge to something that isn’t finished and may not ever be delivered. I’m hesitant to loan money to help development of something that may or may not arrive, and if it does it will be months away. I expect to have my consideration in that area returned by a good deal, instead many Kickstarters like this one want you to pay a premium price for providing them with assistance. £45 is a premium price for a cardboard game – there are games out there for less that are available now and are proven so you can judge exactly what you’re getting. OK, agree with you that the rules may well be a little on the light side – will have to be ‘wait and see’ on that front. I can’t agree with the £45 price point arguement either – although it’s obviously a personal call. 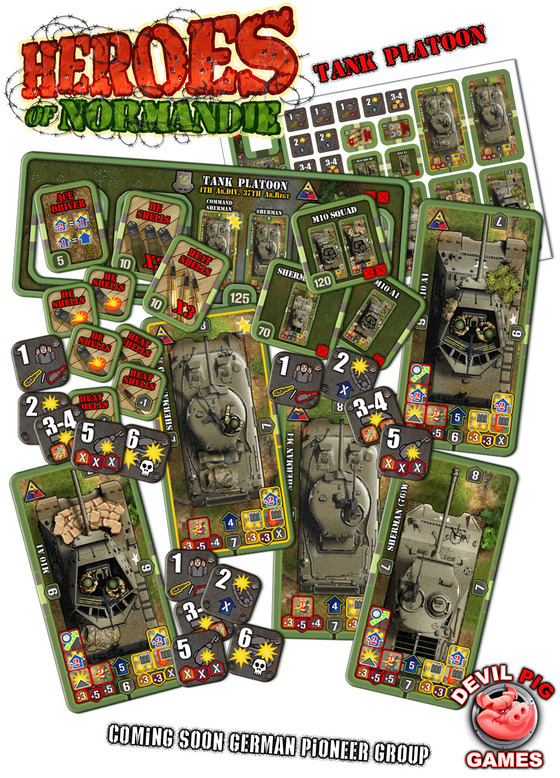 All you have to do is take a look at Conflict of Heroes, for example – that’s all card stock and dice, and retails for more than £45 in the UK – I suspect that in sheer card weight alone, HoN is bigger than either of the CoH games. 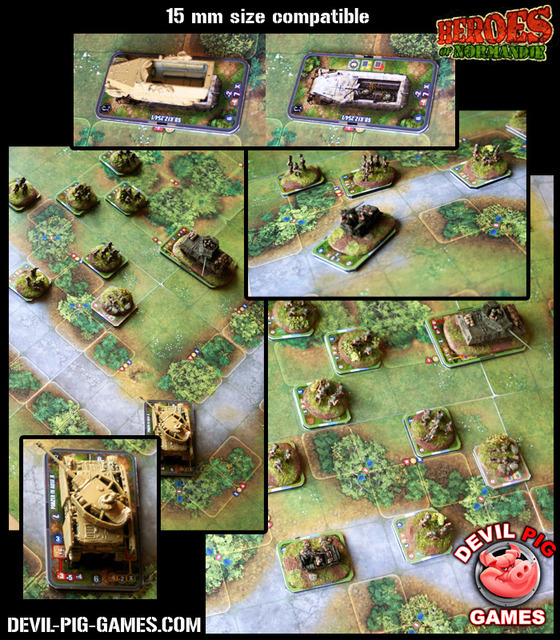 OK, the rules in CoH are much more complex, but it’s still the case that the price point for the base game, considering it’s contents (and assuming that the quality is up to standard) is pretty good, IMO. The risk I am referring to is that there is no guarantee that you will receive your backer rewards, even if the project is funded. There have been cases of funded projects failing with no recourse for backers; their money was just lost. This is an inherent risk of Kickstarter, not comparable to P500 or any other pre-order where you are not charged until AFTER the item is produced and ready to ship. 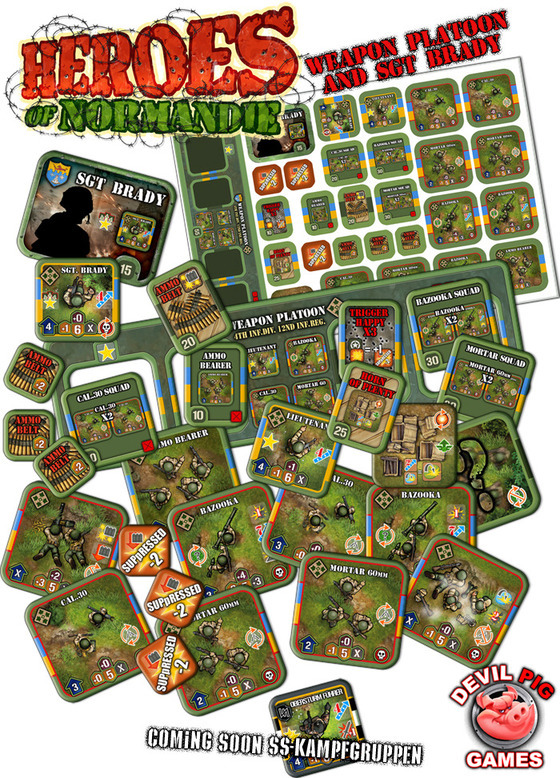 Up Front is currently in danger of being lost due to financial liabilities that the project owner did not disclose during the funding phase; if the court case finds in the plaintiff’s favor Radiant Games will not have enough money to produce the game and deliver the rewards to the backers. At best this project is facing many months of delays due to their money being frozen by the court. As a Kickstarter backer I understand these risks, but I feel that my risk should be offset by something special, and I don’t think that paying full retail for something is a good reward. Again that’s a personal judgement and applies to the Kickstarter model as a whole and isn’t limited to this one project, just that this project is an example of where backers are not given any consideration for their loan and risks taken. Too often Kickstarter backers end up paying more for a product months ahead than they could have spent at retail to get the exact same thing. As far as I know on HoN it hasn’t been announced if these stretch goals will be included or available separately at retail or if they are KS exclusives. The game sounded interesting but why do it on a square grid instead of hexes ? There is a reason why just about every other game of this type uses hexes – squares distort movement and ranges, giving 40% more if you go diagonally compared to orthogonally. It’s crazy to go with square grids, and IMO makes the game look more like a children’s game than a proper wargame. Also the boards might have been useful for other games if they were hexes. I might have got involved it was hex based, but as it is it’s a no from me.